With the start of the Olympic Games basketball tournament now less than a week away, things are starting to get rather exciting. It is hot in Rio but the betting market for basketball fans is also starting to heat up and there is a whole raft of additional bets on offer for the basketball games in Rio. There is a great selection of props bets on offer for the individual games, which we’ll look at in more detail in the week ahead but if you want something that will keep your interest for the entire tournament, how about betting on the top points scorer? We all know that the USA are clear favourites for the Men’s basketball tournament, so it stands to reason that the top pick for top points scorer would be America. As the early betting suggests a spread of about 50 points for the USA versus China match, there could be a few chances where the key American players put themselves out of sight when it comes to grabbing points. It is therefore no surprise that Kevin Durant is listed as the favourite to top the point scoring chart in Rio this summer. It has already been a massive summer for Durant, moving to the Golden State Warriors from the Oklahoma City Thunder, where he has been a massive player. Warriors fans would have been feeling rather low at losing in the NBA Finals, especially after holding such a strong position, but the capture of Durant will have lifted their spirits. You only have to look at Durant’s pedigree to realise that he is a player with plenty to like. He has grabbed a NBA Most Valuable Player award, he has been in six All-NBA teams, seven All-Star teams, he has picked up four NBA Scoring titles, he was the NBA Rookie of the Year and he has already won an Olympic Gold medal. 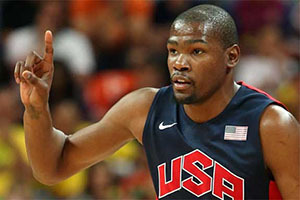 All of which suggests that Durant will not be overawed by the action in Rio and if you expected Kevin Durant to be the top points scorer in the 2016 Olympic Games, you can back him at odds of 2.50. The second favourite player for top points scorer in the 2016 Olympic Games may be a surprise because he isn’t an American. He is however a player with plenty of NBA experience. This is because Pau Gasol is the player that ranks second for the basketball betting sites when it comes to grabbing points for his team. 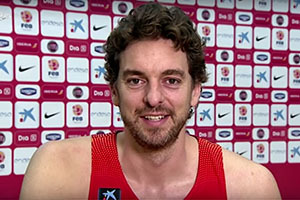 With over 600 games in the NBA (including playoff games) for the Chicago Bulls, Gasol is a player of considerable experience and he has had great achievements with Spain on the international circuit. He won a Gold Medal in 2006 at the FIBA World Championship and has two Gold Medals from the 2009 and 2011 FIBA European Championship. He has also two Silver Medals from the last two Olympic Games, which means he will be desperate to go one step further if he can. It won’t be easy, no one really expects Spain to topple the USA in Brazil, but if they do, Gasol will be a key player. Pau Gasol can be found at odds of 7.00 to be top points scorer in the 2016 Olympic Games basketball tournament. Kyrie Irving is third on the list for top points scorer in the Rio Games and he is another big game player with plenty of experience. Irving may have been born in Australia but he moved to the United States when he was 2 years old, and the influence of his father was a big factor in the player going on to become a top level basketball player. As a player that has just won the NBA Championship with the Cleveland Cavaliers, Irving will feel on top of the world and if you think that he will be the top points scorer in Rio, you can back Kyrie Irving at odds of 9.00. There are some good names in that list and if you follow European basketball, you may find that Nando De Colo is worth a bet at odds of 10.00. With France tipped to perform quite well this summer in Rio, and De Colo being a player that understands how to put the ball into the basket repeatedly throughout a match, he may be a player that shines this summer in Brazil. There is no shortage of basketball betting options available for the 2016 Olympic Games in Rio, so if you are looking to make the tournament more interesting, we have everything you could want or need.